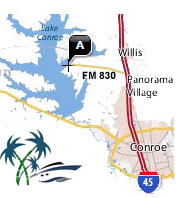 Lake Conroe is the largest recreational boating lake for residents of Houston, The Woodlands, Spring, Katy, Bryan, College Station, Kingwood, Brenham in the great state of Texas! E-Z Aerial - The Palms Marina and E-Z Boat Storage are state-of-the art boating complexes with dry and wet storage for amost any size boat. These are both ‘park and launch’ valet style operations. The Palms Marina also provides more than 150 recently built wet slips in their deep water basin.